Hi friends. I’m checking in with sad news. For all of my friends who went to Temple University J School or RTF back in the day, you probably had a PR class with Dr. Jean Brodey. Dr. Brodey passed away April 30th. I usually don’t allow my mom to post things on my blog so I’m making an exception. Here’s my mom….I’ll be watching her closely. Hi Pugsley’s friends – and some of my friends who follow Pugsley’s blog. I was one of the few Temple grads who didn’t have a class with Jean. I met her daughter, Lisette, about 22 years ago. Mom, I’ll bet Aunt Lisette remembers the exact date. Pugs, do you have some remote keyboard that I don’t see? Through my friendship with Lisette, I got to know Jean. She was so committed to her students and was a real superhero in the Philadelphia PR community. She was always available to offer advice and was excited to hear about what I was doing professionally. Her students adored her. Every one of them with whom I’ve had the pleasure to work over the years is truly gifted because they had Jean’s class as their foundation. I’m sorry I missed out on that opportunity and so happy that I got to know Jean after my life at Temple. Pugsley last wrote about Jean in his blog here. Pugsley and I visited with Jean and Lisette Easter Sunday. Jean was inquisitive, talkative, funny as always and seemed like she hadn’t missed a beat in years. Although more frail than the last time I saw her, she was Jean. Mom, tell everyone that she said I was cute. Everyone, Jean said Pugsley was cute. Tell everyone how she got out of bed to sit on the sofa with me. I’m not sure she sat there just for you Pugs. Now tell everyone how Aunt Lisette taught me how to Skype. Do you want to write this post? No. You can do it. Yes, it’s true. 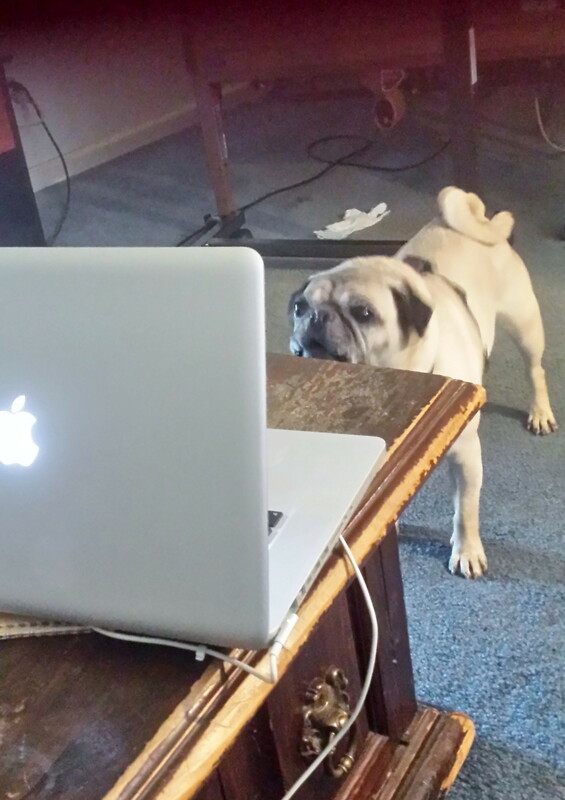 While we were visiting, Aunt Lisette taught Pugsley how to Skype. My Aussie mate Lisa got up in the middle of the night just to talk to me. I think Lisa wanted to talk to Jean and Aunt Lisette and maybe me too. Remember when I jumped onto the table so that Aunt Lisa and I could talk privately and you said that it’s not polite to climb on the furniture in other people’s homes? Well, I was straining to hear her because she was inviting me again to visit her and we were plotting how to get me there. Thank you Aunt Lisette for holding the computer closer to my face so that Aunt Lisa could get a good look at me. Here I am Aunt Lisa! So mom, if it’s 14 hours difference between here and Melbourne, when it’s today here, it’s tomorrow there right, which makes it yesterday for her? So if Aunt Lisa looks up the winning lottery numbers tomorrow, she can Skype me the numbers yesterday so that I can buy my ticket today, right? Pugs, once they announce the winning numbers you can’t buy any more tickets. But it’ll still be yesterday! You make my head hurt Pugsley. We had a lovely visit with Jean and Aunt Lisette, didn’t we Pugs? We did mom. You told Jean we would come back to visit again. I know I did Pugs. Remember that I had my eye surgery and I couldn’t drive for a while? I would have driven us! We could have worn matching eye patches. Well, short of being arrested, I thought we would have more time to see Jean. So lesson learned Pugs: Don’t put off until tomorrow what you can do today. Thank you Thomas Jefferson. Or was it Benjamin Franklin who said that? I’ve seen it attributed to both mom. Whoever said it, it’s still true today. So that means it’s true for Aunt Lisa tomorrow? Everyone, you can visit the Dr. Jean L. Brodey Memorial Facebook page to see photos of Jean and her family and pay your respects to her daughter Lisette and son Kenneth. I’m sure Jean is in Heaven now, handling PR and crisis management for the angels. We’ll miss you Jean. Thanks for everything! This entry was posted in Uncategorized and tagged Dr. Jean L. Brodey by pugsleysworld. Bookmark the permalink. What a very lovely tribute. My mother really enjoyed your visit. She had an amazing rally the day that you came and in so many ways was like her old self. Your visit truly brought us joy. I will cherish this blog. Thank you BOTH for writing it. We love you Aunt Lisette! 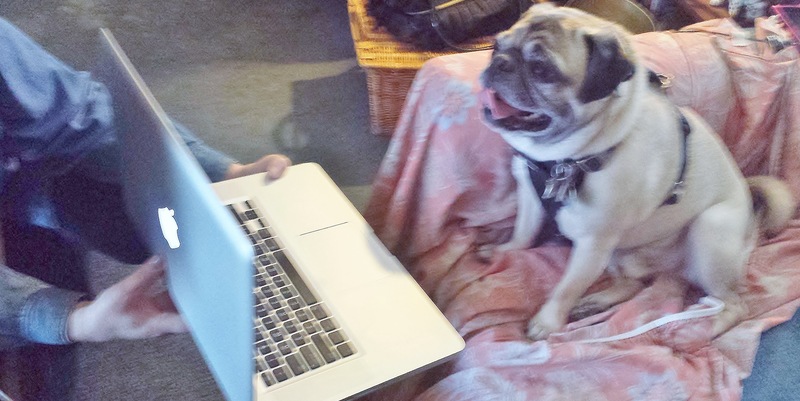 Thanks for this most awesome blog Heidi and Pugsley, I too will cherish it. Thank you f or sharing about Jean — she wounds amazing and I share in your loss. In addition, I must say that Puglsey has to be the smartest dog in the world (but we knew that!) looking at Skype more intently than I do!!! Love you both!! !